B B 1 (1951) The 7 ton wooden gas screw B B 1 was lost overboard from the oil screw Sea Lark on July 13, 1951 approximately 400 miles southwest of Ketchikan. BARBARA HERNSTER (1905) The Barbara Hernster was reported wrecked near Bald Head at the entrance to Plover Bay within Providence Bay on the east coast of Siberia July 24, 1905. She was a two masted schooner of 148 tons built in Fairhaven California by Bendixsen in 1887 for Robert Sudden of San Francisco. At the time of the accident the Barbara Hernster was reported to have been attempting to recover a cache of furs and ivory worth over a million dollars. The expedition was initiated by the Northeastern Siberian Company. Comment: A detailed accounting of this wreck is available online by researching her captain, Olaf Swenson. “Vessel in heavy NE gale, could not weather the ice on the outside and had to follow a lead on inside, and was prevented from maneuvering the vessel.” “Tried to get into a lead where the water was smooth so I could handle the vessel, but could not.” “Gale at seventy miles an hour, blinding snow storm and dark.” “Steering gear carried away at 9:30 P.M. on September 15, ice closed in rapidly and made it impossible to move vessel. Abandoned vessel at 7:45 A.M. on Sept. 16, with eight feet of water in hold and the vessel sank at 11: 45 A.M. on September 16, 1919.” All souls onboard survived. BESSIE REUTER (1892) The 31 ton schooner Bessie Reuter is reported to have been lost in 1892 with all hands in Alaskan waters. BOLCOM NO. 8 (1924) The 63 ton barge Bolcom No. 8 became a total loss in 1924 after stranding at Bluff Point. BRISTOL (1902) The 1274 ton British steamer Bristol was lost on January 2, 1902 along with 7 of her crew of 28. She was on a voyage from Ladysmith, Vancouver Island to the Treadwell Mines in Alaska when she stranded on a reef at 11:00 p.m. off Grey Island, N Dundas Island in Chatham Sound. The Bristol was laden with coal and struggling in a southeasterly gale when the stranding occurred. At 7:00 the following morning, the Bristol slipped off of the reef and sank in 34 fathoms of water. Her master, James McIntyre, her pilot, her chief and her 3rd engineer along with three other crew members were drowned. BUENA VISTA (1870) It was June of 1870 when the vessel Buena Vista was lost in the Gulf of Alaska. BYZANTIUM (1871) The 179 ton brig Byzantium was lost October 19, 1871 after striking a reef in Weynton Passage in Johnstone Strait. The vessel was on a whaling cruise to the north with captain Thomas Welcome Roys at the helm. 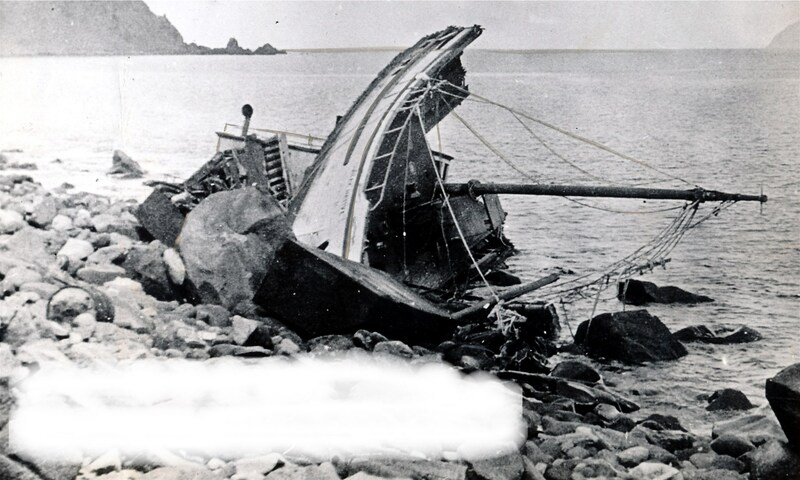 She slipped off of the reef and sank in 60 fathoms of water.